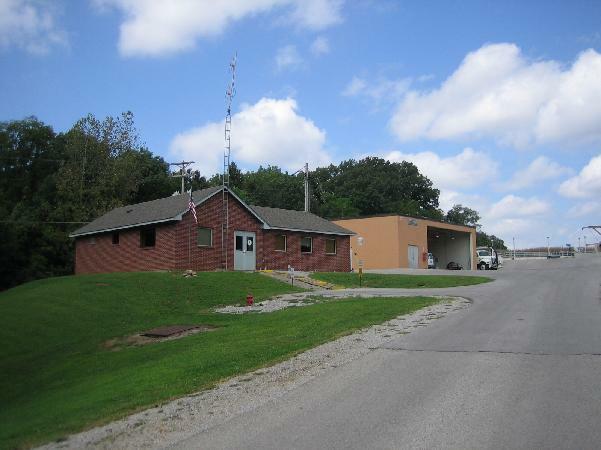 The Oak Grove Wastewater Treatment Plant is located on the southeast end of Christian County, directly off of Hugh Hunter Road, on Carter Road. This treatment plant serves the City of Oak Grove by processing residential sewage. HWEA acquired the Oak Grove Wastewater Treatment Plant from the City of Oak Grove on June 2, 2008. Currently the plant has a design capacity of 750,000 gallons per day. In general terms the plant accepts this wastewater, removes 97% of all impurities, and then releases the treated water into Montgomery Creek. The plant treats or processes the wastewater in several different stages that include screening, settlement, biological digestion, filtration, chlorination, and oxidation. The solids that are present in the raw sewage are first settled out in basins called primary and secondary clarifiers. After the solids are settled out in the clarifiers, nutrients that are still present in the water are biologically digested in the trickling filters and the primary and secondary digesters. After the water has been properly filtered it is then chlorinated in order to kill bacteria that may be present. The water then travels down a series of oxidation steps that increase the oxygen content in the water to ensure that the water is habitable for aquatic life. In discussing performance of the plant, the Kentucky Division of Water requires that certain testing be completed on a daily and monthly basis in order to determine the quality of the water that is released into the Montgomery Creek. The plant does not exceed the effluent parameters. Please note that the Oak Grove WWTP is closed to the public except by appointment. DIRECTIONS: From downtown Hopkinsville take U.S Hwy 68/80 East. Turn right onto US-41A South and go 11.6 miles. Take I-24 East towards Nashville and go 3.3 miles to Exit 89, KY 115, toward Pembroke/Oak Grove. Turn right onto KY 115/Pembroke Oak Grove Road and go 1.6 miles. Turn left at the light onto Hugh Hunter Road and go 1.3 miles. Turn left onto Carter Road and go 0.3 miles to arrive at the plant on the left.